Once upon a time, licensed games were often ignored or overlooked by the gaming community since when you actually played them, they were generally pretty subpar games. In the early days of gaming, almost any popular franchise could end up with a video game based upon it, even those properties that you would never expect to be made into a game and marketed to children. However, there were quite a few standouts, most notably the Capcom developed Disney games. As time went on and technology improved, we began to see an even bigger flood of licensed games, as starting with the PlayStation 2 era, devs could now create video games using art styles and graphics that looked and felt like the franchise that had inspired it. Most notably, we began to see licensed games based on franchises that were inspired directly by children’s media- cartoons, movies, toys, and even books. Right around the last generation is when we started to see a marked improvement in the quality of licensed games, and that continues into this generation, although not everything is a hit. What is essential in making a great licensed game, however, is capturing part of the magic that fosters those warm, fuzzy feelings that we all know and love from our own childhood, and current, fandoms. Dreamworks Dragons: Dawn of New Riders aims to capture that magic in the hearts of its target audience, but also crafts a familiar and pleasing experience for the older crowd as well. As a result, I ended up trading off play time between my 13 year daughter, who is a huge fan of the Dragons series, and its parent franchise How to Train your Dragon. 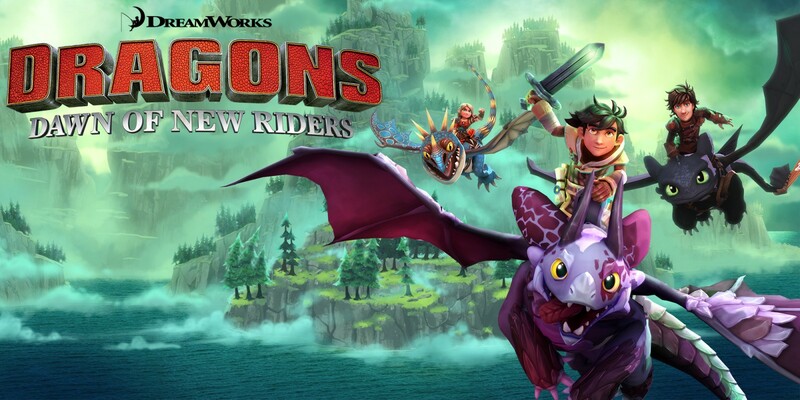 While Dreamworks Dragons: Dawn of New Riders roughly coincides with the release of the upcoming third How to Train your Dragon movie, The Hidden World, Climax has actually crafted a game that takes place alongside the spin-off series. This allowed them to create their own protagonist for the game, and enabled them to make a new dragon that justifies the game’s mechanics. As such, any players looking forward to hopping into the Dragons universe as Hiccup or Astrid will be disappointed to find that they aren’t playing as them, but they do play an important role in the story. Hiccup takes on the role of main quest giver, and Astrid plays the role of potion merchant. Gobber the Belch also shows up as your blacksmith for weapon improvements. As could be inferred from these revelations, Dragons: Dawn of New Riders has some light role-playing elements, but they are well integrated and don’t bog down the gameplay by requiring the same level of micromanagement that the genre and its mechanics tend to bring to the table. Dragons: Dawn of New Riders is an action adventure game. While the game is 3D, it utilizes the top down view similar to that found in classic 2D Zelda games, unless you’re flying between islands, at which case it switches to a third person perspective. The story in Dragons: Dawn of the New Riders opens up with Hiccup patrolling the skies on Toothless, and seeing a large plume of smoke, descends to Havenholme Island to find the cause of the problem. After landing and finding the town in burning ruins, Hiccup happens upon an outsider that can’t seem to remember anything about themselves, whom he dubs Scribbler based on some writing in a book that he holds and a mysterious dragon egg. Hiccup hears a roar in the distance, and goes to investigate. One of the suspected culprits of the town fire comes on screen and explodes a smoke bomb, escaping with the egg. You then grab an axe and shield from nearby chests that Hiccup told you to use in case you need to defend the egg, and while in pursuit of the bandit, you run across a screen where an enemy spawns and you get your first couple of combat tutorials. After completing these, you find the egg only to be captured, by a falling cage trap (somehow), and the bandits come out to take the egg. Only, the egg hatches in a smoke, lightning, and fiery explosion which decimates the cage that Scribbler is in without harming him, and this impressive delay convinces the bandits to run away from the dragon. Hiccup reappears, and upon seeing the dragon hatchling, realizes that the egg was unfamiliar to him because he had never seen a dragon like this. It appears to be a patchwork of a few different dragons- a chimeragon, if you will, and dubs the dragon “Patch”. Hiccup is then recalled to Burk by Gobber via Terrible Terror (Terror mail), and Scribbler pledges to find the mysterious roar and report back to Hiccup. Patch accompanies you on your journey, and his status as a chimera dragon enables him to have various elemental abilities that you will need to utilize on your journey to help you solve puzzles, overcome obstacles, and assist in fighting enemies and bosses. You soon learn that some of the dragons have become hostile, but only because they’ve had gas-filled orbs fitted to their bodies that enable them to be remotely controlled by our hidden enemy. After you encounter this first dragon and destroy the orbs around their body, the dragon will become docile and fly away. Most of the rest of the enemies are lackey Vikings like the bandits found in the beginning of the game, and most of your bosses are dragons that are under the influence of the orbs. After you defeat a boss, you unlock a new elemental ability for your chimeragon, Patch. You get new weapons, armor, and potions by finding them in chests, or harvesting resources and bringing them to the appropriate merchant. Resources are obtained by chopping down trees, bushes, and stones. You improve your health by finding heart containers. Dragons: Dawn of New Riders pulls heavily from classic 2D Zelda, and that is very apparent pretty early on due to these similarities, and more so when we get to the structure of the game. You explore an island, go into a dungeon. You explore the dungeon, solving puzzles to open up new paths. Instead of having new items, relics, or power-ups to access new areas, you unlock the dragon abilities to help you overcome puzzles found within the dungeons. Each of these elemental abilities also helps your dragon grow bigger and stronger, and you swap between Scribbler and Patch to navigate the island and dungeons. This is very similar to swapping between characters in the Lego games, and for most younger gamers, probably feel a lot like Skylanders. In this regard, the biggest disappointment that we had with the game comes from the fact that it really feels like you should have had the ability to add a second player whenever you wanted to during the game, with one person taking on the role of Scribbler, and the other Patch, but instead we are restricted to swapping between the two as obstacles and puzzles arise. Boss fights are your standard fare. They’re difficult at first, but once you recognize their pattern, it’s a pretty easy fight. If you happen to die, you start over at the last checkpoint, and these come frequently enough that you never lose too much progress. Keeping in mind that the game is designed for a younger audience, it is a fair balance of challenge and checkpoints, but older or even just more experienced gamers may find it a little lackluster. The gameplay is fairly solid overall, but there is nothing new to be found here. It follows the standard Zelda formula, with the biggest difference being the necessity of travel between islands being flying around the sky on your dragon. Since they programmed in the flight of the dragon and the ability to freely fly around the chain of islands, it would have been nice to have at least one boss sequence that takes place in the sky, or even just an obstacle course or the like to give the game a bit more variety. One of the most important things that a licensed game must do, besides be an interesting game, is to be faithful to the source material and present familiar characters in a faithful manner. While the place names, humor, dragons, and atmosphere is accurately recreated in Dragons: Dawn of New Riders…the character models for the humans feel very scaled back and almost make them unrecognizable. In addition to that, the game skimps out by not having voice acting present beyond the most basic reactionary grunts, sighs, and chuckles. Those familiar with handheld JRPGs will be especially familiar with this presentation, where all of the dialog is written out in text boxes while the avatars let out one sound that might be appropriate. I definitely understand not having every bit of dialog voiced by the original cast or even with soundalikes, but it would have been nice for the cut-scenes, to at least be voiced. While the game will be fun to play through because of its familiar elements and the emphasis on rewarding puzzles and exploration over combat (that never gets too difficult), it really falters at the conclusion of the story. It seems to end very abruptly after about 6 hours, and it just felt like there should have been more. If you are a fan of the How to Train your Dragon series, and would like to get a solid Zelda clone with fun elements associated with their beloved series, then this is probably a must buy. However, know that there might be some disappointment with the game. On the plus side, the game runs flawlessly. Dragons: Dawn of New Riders would be improved greatly by having co-op added in, and that alone could have bumped the score up a little bit. It is a serviceable budget title, and it plays well to its audience, but doesn’t bring anything new to attract older players or those unfamiliar with the series.